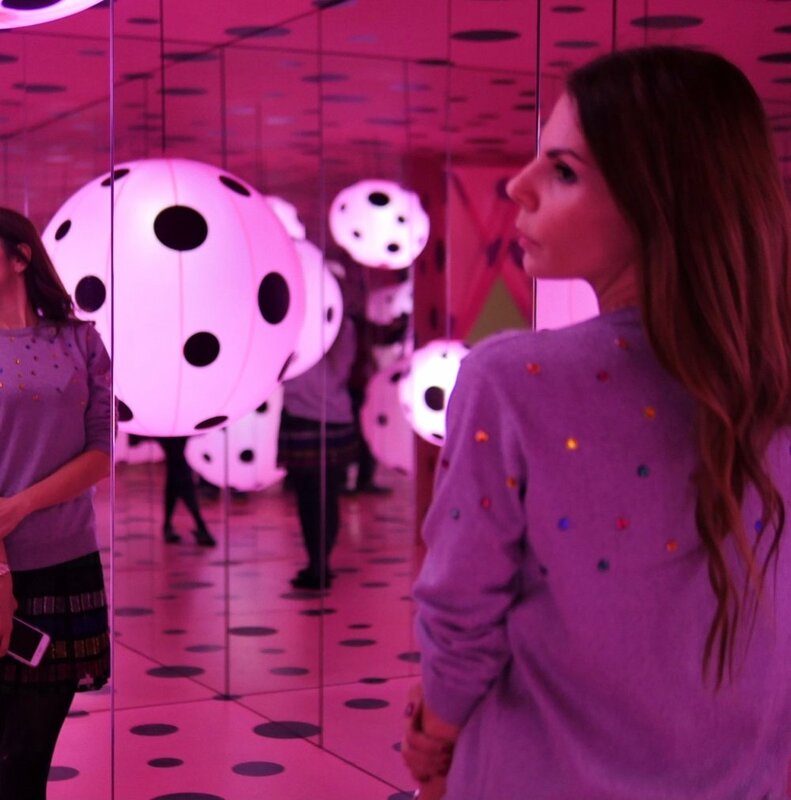 I don’t know how many times I have been in one of Yayoi Kusama’s mirrored rooms. 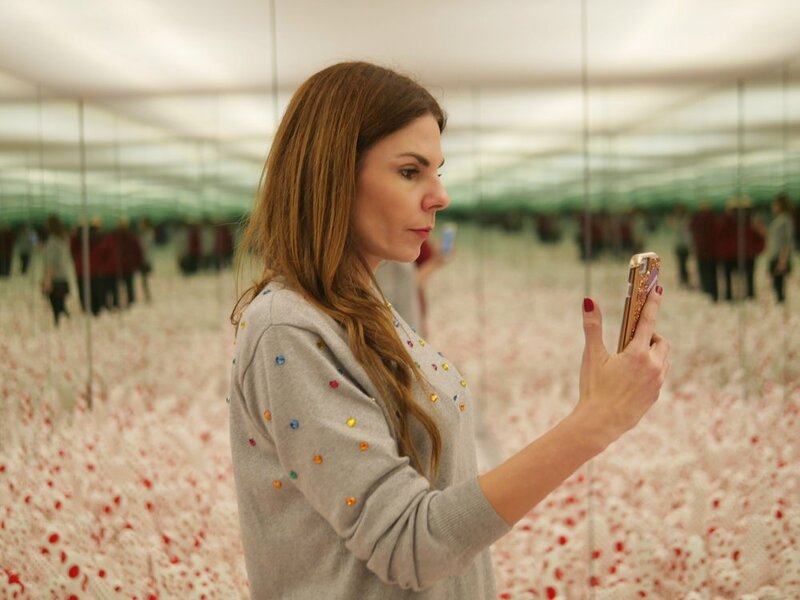 There have been mirrored rooms assembled at David Zwirner, the Whitney Museum and the MoMa in New York, Victoria Miro in London, the Broad in Los Angeles and many, many more galleries and museums all over the world. Yet every time I go inside one, I still feel that it is worth the magic. 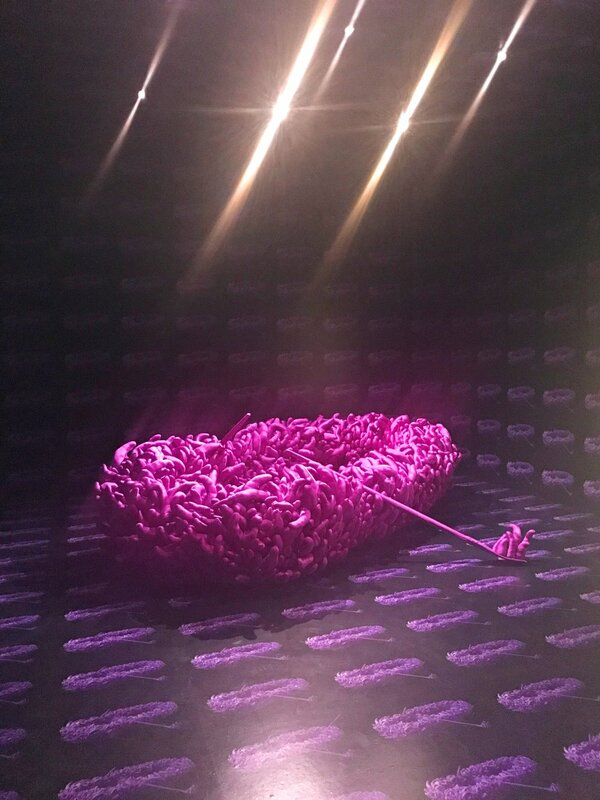 Last night, the preview of Yayoi Kusama: Infinity Mirrors at the Hirshhorn Museum in Washington D.C. has topped the experience and amped it up to the max. For the first time in the 65 years of Kusama’s career, the Hirshorn is showing six of these rooms in one exhibition, alongside a series of more recent vibrant and color-saturated paintings and sculptures from the “My Eternal Soul” series; photographs from her New York performances in the 60s, a tentacle-covered purple rowboat from 1994 called “Violet Obsession,” and a gigantic fiberglass-dotted pumpkin placed in the garden that is so characteristic of her work, given that she grew up in a farm surrounded by her family’s seed nursery where she learned to love and appreciate gourds as a source of radiant energy. 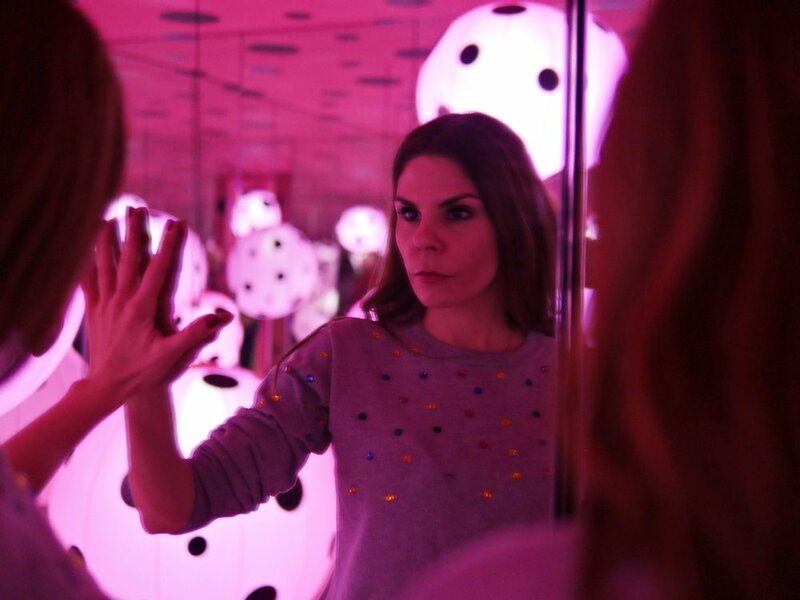 Going back to the infinity mirrored rooms, I think crucial to understanding this exhibition is to know that Kusama was the first artist to employ mirrors in this way, starting in 1965 with “Phalli’s Field,” which she first showed at the Richard Castellane Gallery in New York. 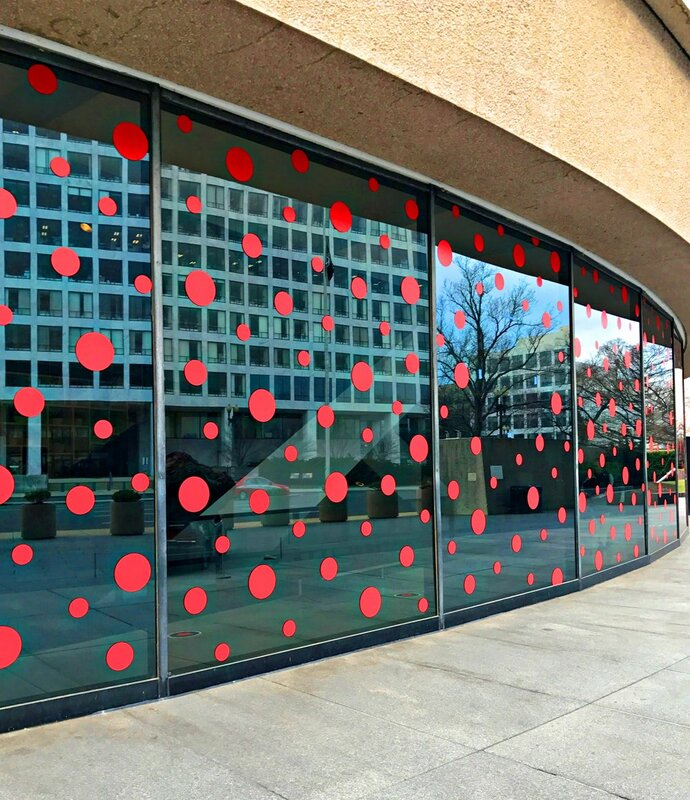 Fifty-two years ago, Yayoi Kusama was looking to convey an art-relational experience for the audience that wasn’t available anywhere else - walls and ceilings were covered in mirrors and the room itself was filled with red and white phallic-stuffed sculptures. “Phalli’s Field” is at the Hirshhorn, still causing a reaction in people that ranges from awe to utter delight to claustrophobia. 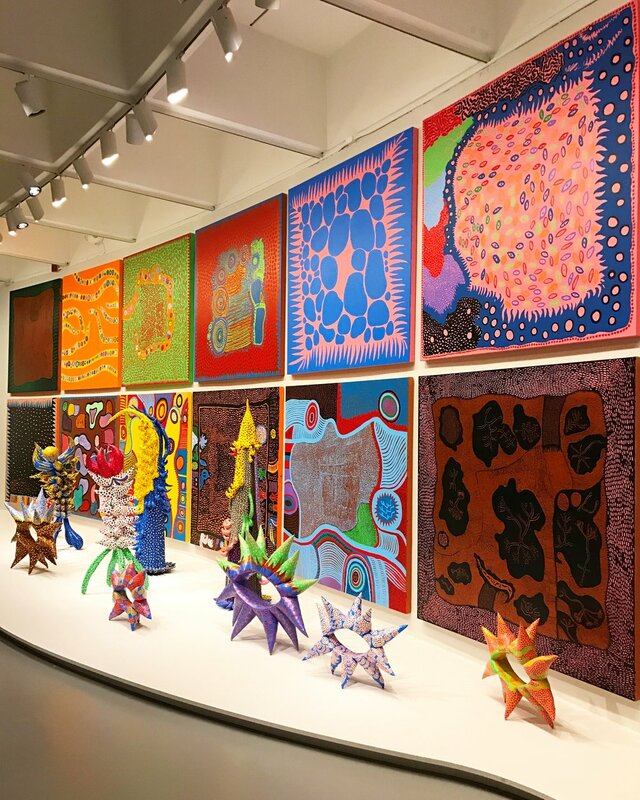 As an artist that was diagnosed with a serious case of obsessive-compulsive disorder, Kusama has made the most extraordinary career from what she calls being “an obsessional artist.” It is that repetition in objects, lights, shapes and polka-dots that has captivated and engulfed viewers, curators and collectors for more than half a century. Inside"Phalli’s Field" room 52 years after the creation of the first one, this time at the Hirshhorn Museum in DC, Iphone in hand, instagramming live. 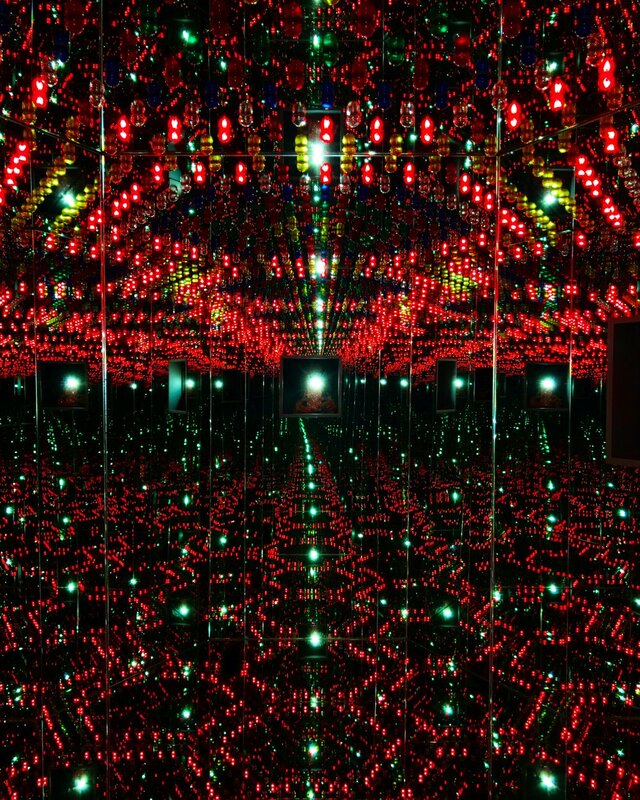 The second room is “Love Forever”, 1966/94, which is experienced as a “peep show”, with viewers outside looking in and seeing thousands of blinking lightbulbs changing colors in an orchestrated manner reflecting on all the mirrors. The result looks like a hybrid of a 70s nightclub and the inside of a video game. Looking in “Love Forever”, 1966/94. Picture by Albert Ting. The third room is “The Souls of Millions of Years Away”, 2013, and is completely immersive. 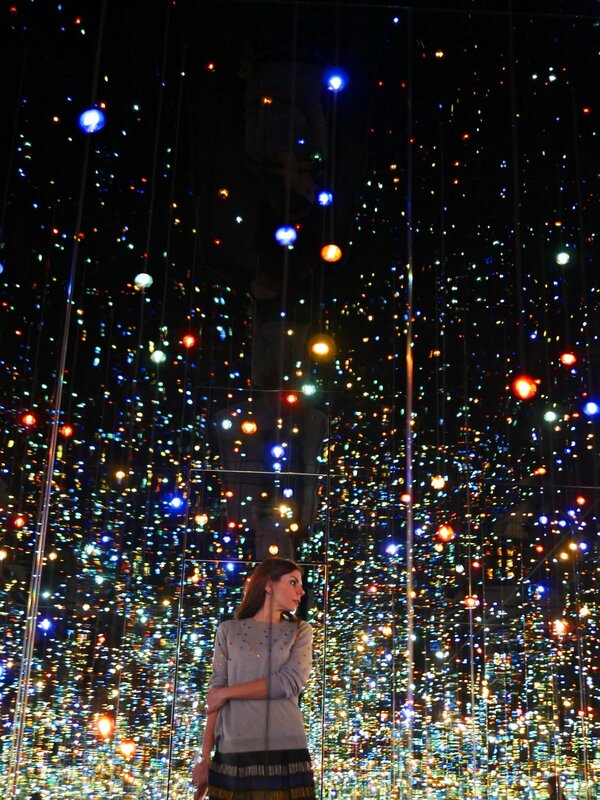 As if floating in a galaxy, Kusama added white and blue LED lights, creating the closest approximation of infinity in real time. “Souls” is followed by "Dots Obsession – Love Transformed into Dots", 2007, where participants can interact with suspended dotted vinyl balloons multiplied a thousand times by the mirrors on the walls, floor and ceiling. 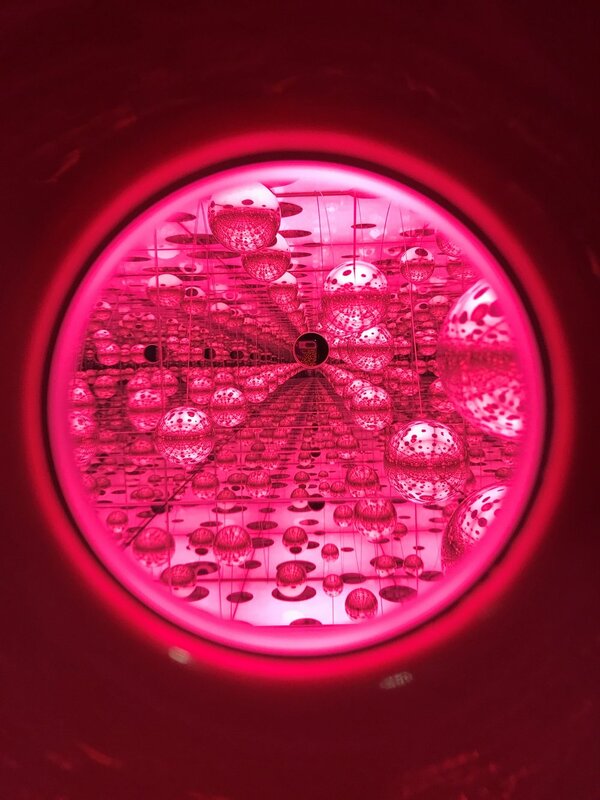 “Love Transformed” also includes a contiguous smaller peep-in mirror dome that has to be seen from the outside and shows thousands of suspended spheres that look as if swimming in a hot pink pool. 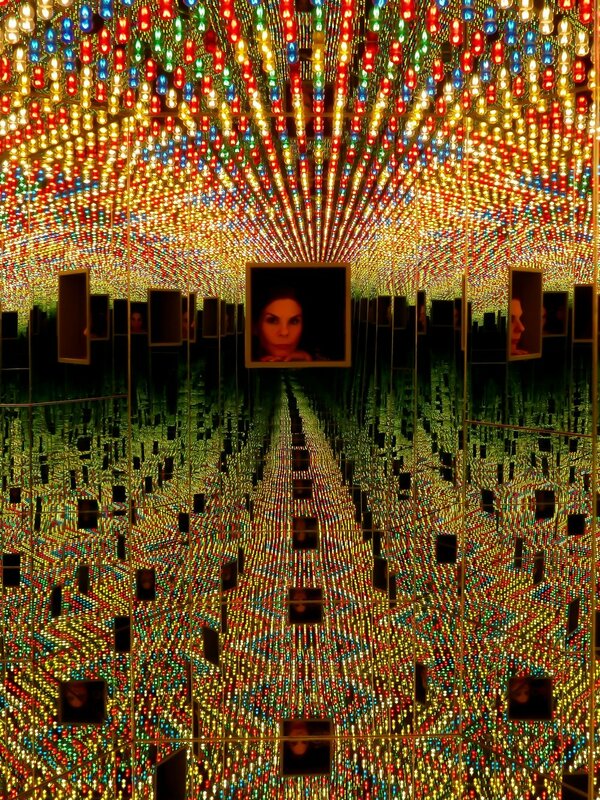 The next room in the hyper-charged sensorial experience is “Aftermath of the Obliteration of Eternity”, 2009, also using LED lights, these more in the yellow and gold tones, Kusama created this room for her eightieth birthday and channels her lifelong obsession with the dissolution of self into the infinite; the delicate spectacle of lights is engulfing and fascinating, until all lights go off and the cycle starts again, as the mystery of life appears to be. 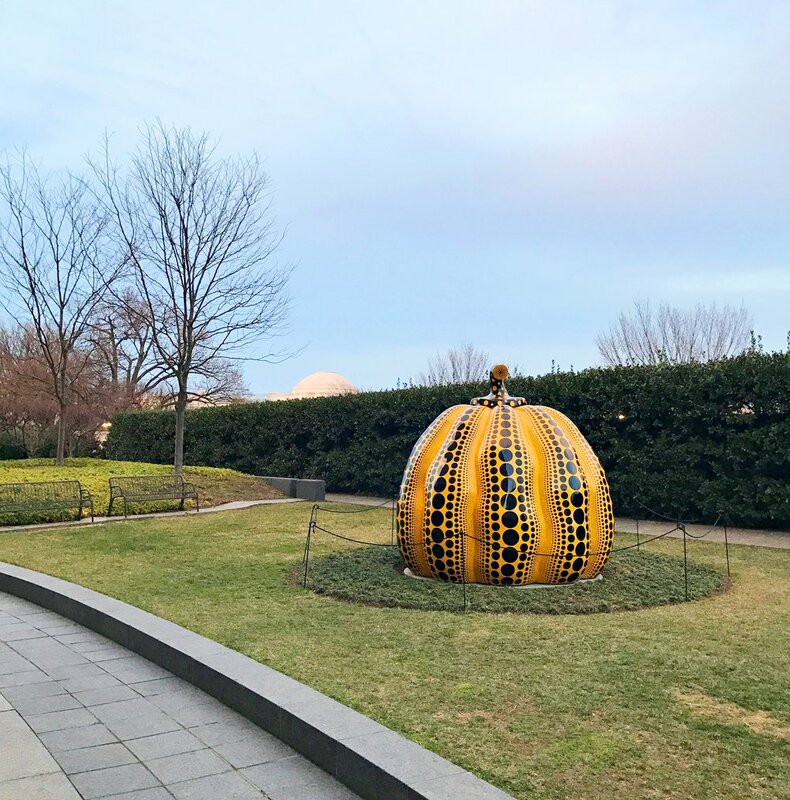 “All the Eternal Love I Have for Pumpkins”, 2016, is Kusama’s latest room, never shown before in the United States. 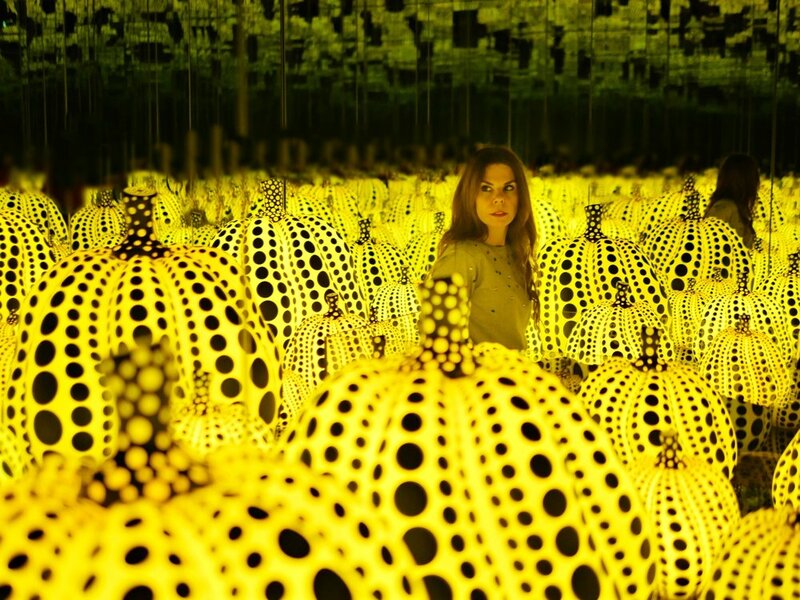 Going back again to her most beloved motif: the floor is covered in resplendent acrylic pumpkins dotted over and over again, mirrors and LED lights surround the experience, resembling a fairy-tale field. The last room, the “Obliteration Room” 2002-Present is the continuously reinvented white space co-created with the help of visitors who use dotted stickers in a variety of sizes and intense colors to place anywhere they want, until the room is totally “obliterated”. There was an interesting feeling to see the room almost spare, as I came to see the show before it opened to the public. Having only a few dots here and there seemed contrarian to what the mirrored room experiences had given me a few minutes before. It was however in this room that I sat and had an opportunity to self-reflect about all that I had just seen, about how many times I obsess over things that should not occupy my mind or how many times I’ve wanted to obliterate myself from certain moments and circumstances of my life. I felt overwhelmed and overjoyed, and it was then when I really got a little glimpse of Kusama’s brilliantly crazy mind.